If you’ve had the pleasure of joining Baton Rouge in celebrating the New Year in Town Square, you know just how much of a good time is had by all. Downtown Baton Rouge comes alive and 3rd Street is crowded with patrons crawling from bars to restaurants, until the countdown to the Red Stick drop begins. 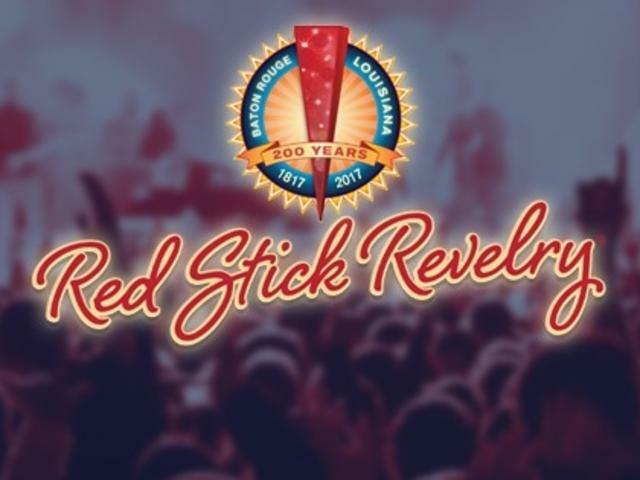 But this Fourth Annual Red Stick Revelry will be special as the event will officially kick off the Baton Rouge Bicentennial! 2017 marks the 200th year of Baton Rouge’s incorporation as a city and all year long the city will celebrate with bicentennial-themed events commemorating Baton Rouge. At Red Stick Revelry there will be a dedication of a bicentennial plaque as well as a birthday cake for Baton Rouge. Red Stick Revelry New Year’s Eve Event begins earlier this year with fun children’s activities in Town Square starting at 11 a.m. Come bring the young ones to enjoy a kids’ day before the grownups play. 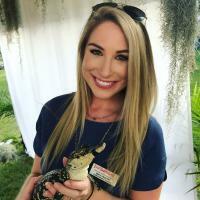 Hands-on activities will be brought to you by the Arts Council of Greater Baton Rouge and East Baton Rouge Parish Library. From face-painting to art contests and enjoying the rhythms of the Bloco Jacare Samba drummers in the street, there’s plenty to do until the main NYE event is kicked off at 7 p.m. on The Crest Stage by Andre Moreau. Various performers will entertain throughout the day like fiddle-champion James Linden Hogg and Bread Pudd’n, then Phat Hat will take the stage for the main event until midnight. 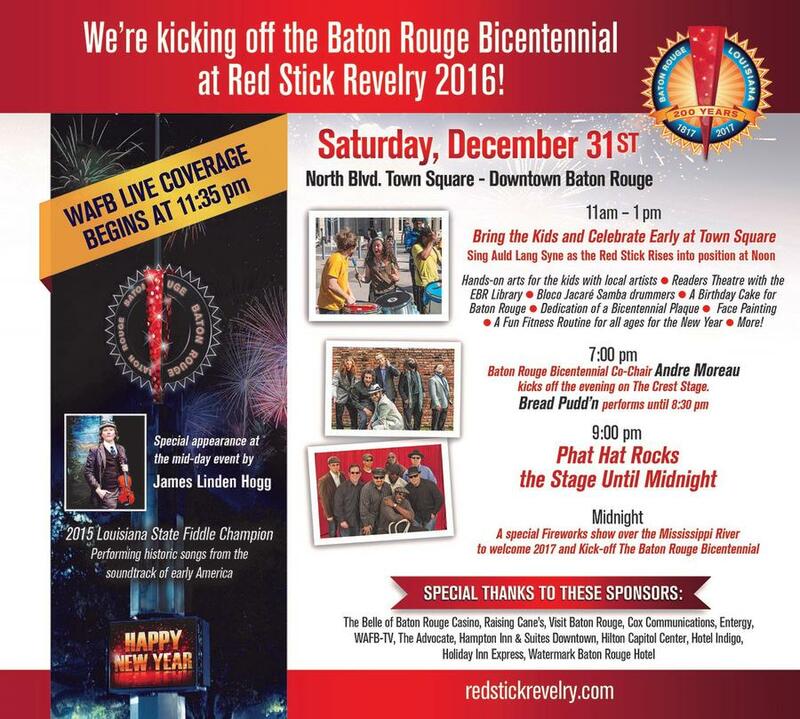 Join Mayor Kip Holden in singing Auld Lang Syne as the Red Stick rises into position, then when the clock strikes midnight and the Red Stick Drops, enjoy the luminous fireworks show over the mighty Mississippi to welcome 2017 and kick off the Baton Rouge Bicentennial. New Year’s Eve is the perfect time to celebrate and look forward to the future of what’s to come for our great city. To learn more about the Red Stick Revelry family activities beginning at noon and to see a list of all activities and performances, visit http://www.redstickrevelry.com/.